Jätkäsaari is comprised of four previous islands now adjoined to the mainland. In the future, the area will provide an urban environment for jobs and homes. The main principle is that the number of floors decreases when moving from the centre towards the sea. Jätkäsaari is comprised of four previous islands now adjoined to the mainland. In the future, the area will provide an urban environment for jobs and homes. The main principle is that the number of floors decreases when moving from the centre towards the sea. Low-rise apartment buildings and terraced houses will be built close to the shore. There are cafeterias and shops along the streets. Yet almost one fourth of the area is park. We are building in the northwest corner of Jätkäsaari, in the Saukonpaasi peninsula. It is separated by a canal from the rest of Jätkäsaari, so it is surrounded by the sea in three directions. The apartment blocks opposite to Ruoholahti and Salmisaari are almost completed, and the construction will move forward towards the canal. Once the construction is completed, there will be green parks in the middle and on the tip of the peninsula. 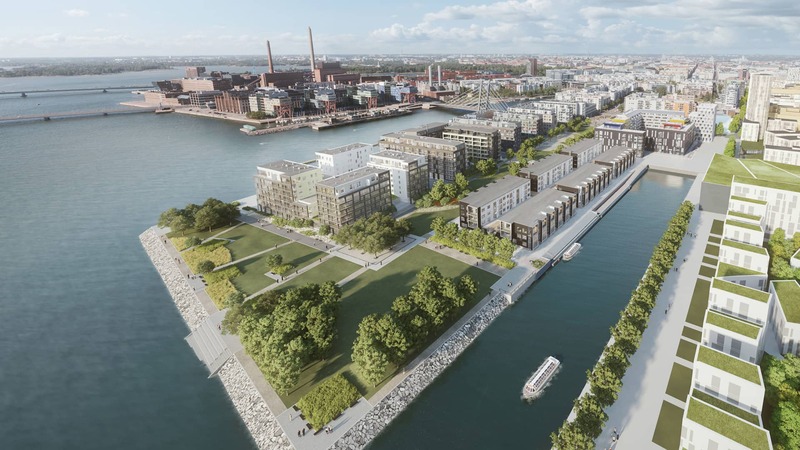 For additional information about the development of Jätkäsaari, please see the Helsinki City website, http://en.uuttahelsinkia.fi/jatkasaari. It is less than three kilometres from Saukonpaasi to the centre of Helsinki, and the closest tram stop is only a couple of minutes’ walk away near the bridge of Crusellinsilta. Two tram lines are easily accessible from Saukonpaasi: Line 8 via Ruoholahti crossing Crusellinsilta bridge and line 9 running via Kamppi and the Railway Station to Pasila. The Jätkäsaari passenger harbour offers frequent departures to Estonia. Ruoholahti metro station is located 750 metres away. You can walk along the Ruoholahti canal shore to the Länsilinkki bridge on the southern end of Mechelininkatu. Pedestrian and cycling routes to Kaivopuisto, Taivallahti and, via the Baana bicycle corridor, to Töölö Bay and the Central Park, start from there. The Saukonkari low-rise apartment buildings are located along the canal. There is a total of almost six kilometres of seashore. Saukonpaasi is located at the end of the headland, across Lauttasaari. In the future you can also enjoy the sea along the canals and at the swimming beach located at a sheltered bay. In addition to the seashore routes, you can make walking trips in Hyväntoivonpuisto park running across the entire Jätkäsaari area. The park will be constructed in sections. Outdoor and sports enthusiasts are served by a five-hectare sports park with sports fields and the Bunkkeri sports and recreational centre to be built next to it. A well-being quarter and hub of commercial services has been planned close to the sports park. The nearest marina is located in Saukonpaasi. One or two grocery shops and specialty shops will be located in the Saukontori centre, in the immediate vicinity of the Saukonpaasi residential area. There are several schools and day-care centres nearby, and even more are being planned. The distance to the Hietalahti market square is 1.6 km, to the Stockmann department store 2.3 km and to Helsinki Central Railway Station 2.6 km. The closest shopping centre is less than a kilometre away in Ruoholahti. The Jätkäsaari area is comprised of four previous islands now adjoined to the continent: Hietasaari, Saukko, Saukonkari and Jätkäsaari. The islands have been inhabited from the 19th century. In addition to permanent residents, the people of Helsinki had summer villas on the islands. Boat trips were made to them, and the sand beaches attracted swimmers. People swam on Saukko during the summer and went there sledding in the winter. The rocks of the island were high and magnificent – even too fierce for the smallest ones. Legends say that Uno Kurtén, CEO of the life insurance company Kaleva, lived on the island during summers and had himself rowed to the island every single summer evening after a day at work. The islands were occupied by industry, such as candle and tar plants, in the early 20th century. The rocks of Saukko island were quarried and their red granite can be seen on the walls of many Helsinki monuments: the Uspenski Cathedral, St. John's Church and Pitkäsilta Bridge. Construction work on the harbour began in 1913. So much seafloor was filled that the area tripled from the original plans. The four islands in the area – including the Saukko island – were adjoined to the mainland. The area was given the name Jätkäsaari in 1928. According to one view, the area was named Jätkäsaari, Finnish for "Stevedore Island," after the stevedores that worked in the area. The harbour served Finnish industry for over 80 years. In 2008, the cargo ship harbour was relocated to Vuosaari, and the reconstruction of Jätkäsaari as part of Central Helsinki began. Storehouses designed by Lars Sonck, Huutokonttori that used to provide employee facilities for the port, and the massive 1970s Bunkkeri warehouse are reminders of the past.